As we’ve seen targeted threats increase in recent years, we’ve also witnessed the rise of the threat actor group. Not a lone hacker, but a team of individuals with a specific mission to compromise technology. Whether these groups are focused on compromising and leaking information, stealing financial data, or hacktivists driven to disrupt service or deface websites, what they have in common is the willingness to pursue and attack very specific targets often using unique or brand new TTPs. 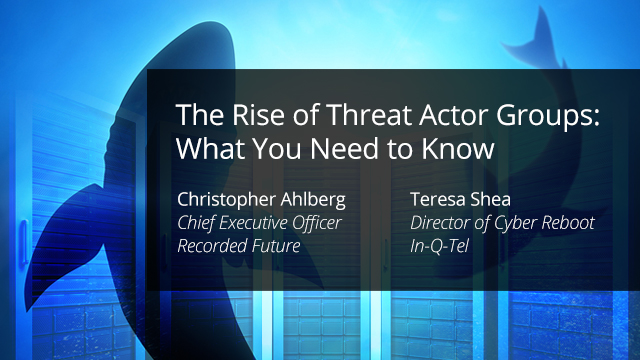 In this “virtual fireside chat,” Recorded Future Chief Executive Officer Christopher Ahlberg will be joined by Teresa Shea, director of cyber reboot at In-Q-Tel, to discuss how the actions of threat actor groups bear direct relevance to any organization's cyber security strategy. • Should companies research threat actors? Or just harden their defenses? • What types of threat actors should companies be aware of? • Is cyber terrorism a real threat? • Does attribution of actors matter for businesses rather than just government agencies? • How will the landscape change over the next five to ten years, and which countries are on the rise?